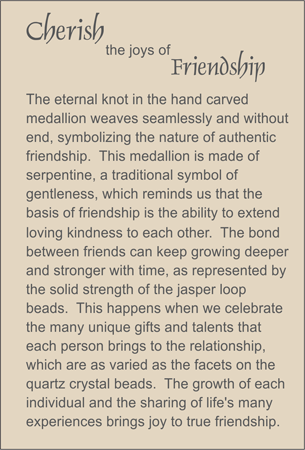 A hand carved, taupe-color serpentine medallion depicting the eternal knot in a diamond shape represents the importance of loving relationship. A five some of blue lace agate tumbled nuggets forms the body of the necklace, and are set into patterns of large rock quartz crystal ellipses and cylinders. Smoky quartz ellipses provide punctuation. Sterling silver spring clasp.